Sources – View dashboards to verify that Office 365 and organizational data is loaded. Upload – Prepare and upload organizational and customer data. Analysis settings – Customize meeting exclusion rules to help ensure data accuracy. Admin settings – Configure system defaults and privacy settings. Open the Workplace Analytics Home page. If prompted, sign in to your work account. In the left navigation pane, expand Settings to show links to the available pages. Access to one or more pages in Settings depends on what role you're assigned in Workplace Analytics. The following describes page access based on role assignment. For more information, see Assign Workplace Analytics roles. The Sources page provides dashboards that describe the Office 365 data and organizational data that has been loaded into Workplace Analytics. You can view average weekly meeting and email activity and measured-employee characteristics to ensure sufficient data coverage. On the Upload page under the Organizational data tab, you can upload an organizational data file to Workplace Analytics. This file must be in .csv format, UTF-8 encoded. Organizational data is contextual information about employees (for example, job title, level, location) and can come from HR or other information systems. For detailed information on preparing an organizational data file for upload, see Prepare organizational data. 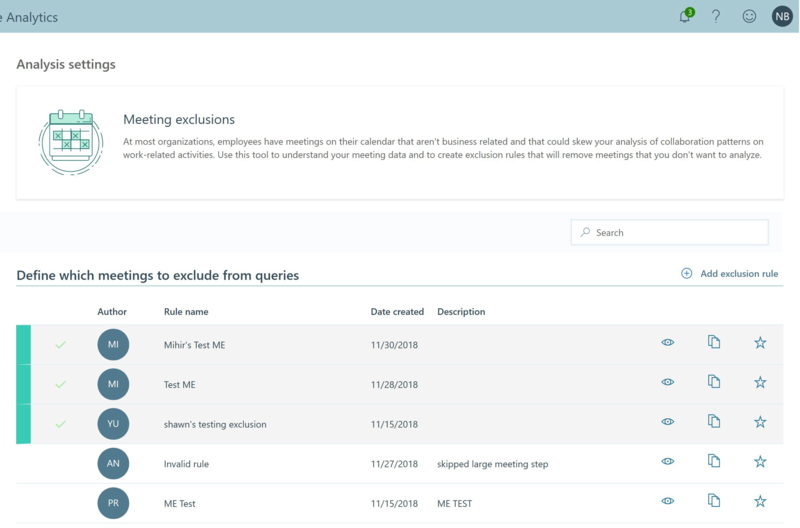 On the Analysis settings page, you can create and customize meeting exclusion rules to remove meetings (such as appointments that are unrelated to work) that you don't want to include in analysis. For detailed information on how to create new exclusion rules, see Meeting exclusion rules: walkthroughs and Meeting exclusion rules: Tools and concepts. On the Admin settings page, you can configure system defaults and privacy settings. Changes made to these system defaults are applied soon after the next data refresh of your organizational (HR) data or Office 365 collaboration data. These changes apply to data retroactively and can affect calculations of historical metrics. Use this setting to configure the default time zone for your organization. Typically, this is the time zone of the corporate headquarters or the time zone in which most employees reside. Workplace Analytics first attempts to read time zones from each user's mailbox. If time zone has not been set up for the mailbox, Workplace Analytics tries to determine it from the organizational data. If time zones have not been uploaded in the organizational data, Workplace Analytics reads the time zone from the setting on this page. If the default time zone was not set on this page, Workplace Analytics uses Pacific Time (US). For Default time zone, under System defaults, select the applicable time zone. Users can set their own working days and hours in Outlook settings. Workplace Analytics attempts to read these custom settings from each user’s mailbox. Failing that, it uses the values for employees' working and non-working days and hours that you have set in the System Defaults section. For Working days, select the appropriate days of the week. For Working day starts and Working day ends, select the appropriate start and end times. A value for Hourly rate is used to calculate the cost of low-quality meetings: a person's hourly rate for the organization multiplied by number of low-quality meeting hours. Workplace Analytics first tries to get the Hourly rate value from organizational data. Failing that, it uses the value of Hourly rate that is set on this page. For more information, see Meetings overview. In the Hourly rate field of the System defaults section, enter an average employee hourly rate. The minimum group size setting determines what you can view in the Explore metrics dashboards and in the Solutions area. The minimum-group-size rule protects people from being identified by causing charts to display data differently. In the following chart, the blue-green columns on the left represent groups whose size exceeds the minimum group size. For this reason, they display real data. The gray and white columns on the right represent no data because the groups are below the minimum-group-size threshold. The minimum-group-size rule applies to charts that display information derived from HR data. In other words, the charts display information about circumstances that exist in your organization -- such as managers at a specific level or employees in a particular city. If the filter group is too small, no histogram appears. If the filter group that the histogram uses for its data is below the minimum group size, Workplace Analytics does not display the histogram at all. If the bin population is too small, the bin still appears. In histograms, the x-axis consists of rectangles, called "bins", that are based on average metric values, and the y-axis determines the number of people whose average metric value puts them in that bin. Neither of these values reflects organizational data. For this reason, the histogram still displays data for a bin even if it contains fewer people than the minimum-group-size value. 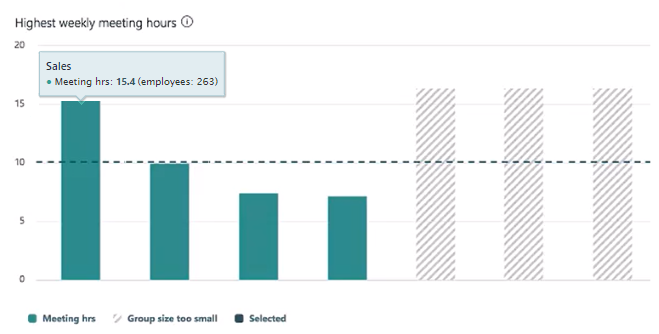 Histogram charts can safely display this information because the information is based on metrics -- on values calculated from observed behavior, not on HR data. Even if a bin in a histogram contained data for only one individual, the histogram still displays that data. You cannot single out this individual because you do not know what HR group they belong to. (In other charts, such as column charts, an individual in a group below the threshold might be identifiable, but in a histogram the HR group to which individuals belong is the larger filter group.) You also cannot determine the precise metric value of individuals because they are in a bin with a minimum 0.5-hour range. To track program success on the Track page. Use this setting to control whether to include or hide subject lines in Meeting query results, which, by default, are not shown. If you select Yes for Hide subject lines from meeting query results, the subject lines are converted to a hashed value (a system-generated number), so that the text in subject lines is not readable in any queries. You can still create meeting queries that include subject line keywords as meeting attributes. However, you won't be able to see a list of meetings that show the subject lines. Example If you select Yes, you could run a meeting query with the subject-line keyword "All-hands." Based on the attributes you include in the query, the results could show data about the number of meetings, the length of meetings, the size of meetings, and so on, with that subject line. However, you could not get a specific list – one line item for each meeting – of all the meetings with the subject line "All-hands." Workplace Analytics offers a second opportunity to control which HR attributes are included in query output. You can make selections for the "Include in report" and "Hash in report" options in a dropdown menu when you map uploaded HR data. For more information, see the descriptions of Include in report and Hash in report in the Field mapping section of Upload organizational data. That is, you can exclude from analysis any emails and meeting invitations to, or from, specific users, or exclude all users from specified domains. Any and all emails and meetings in which these email addresses are included (as both sender or recipient, and attendee or invitee) are now excluded. Regarding domains, you only have the option to exclude (blacklist), not include (whitelist), specific domains. Terms can be any combination of letters, numbers and special characters (e.g., client attorney privilege, D&I, etc.). Any items you exclude will not be included in the analysis, so it is important to carefully consider and balance your privacy and data-analysis goals. If you exclude domains, email addresses, or subject terms that frequently appear in the collaboration data set, it could adversely skew your analysis. Exclusion occurs before metadata is processed within Workplace Analytics. Learn more about Workplace Analytics privacy and data access. Office 365 admins should not assign licenses to any excluded email addresses. As an example, if you exclude the email address of the CEO, (ceo@company.com) all meetings and emails in which the CEO is included are removed from analysis. This means that for all meetings and emails that include the CEO, the metadata for all other recipients and attendees included in those same emails and meetings is also excluded. If a user has multiple aliases, you must enter every email address for each alias that you want to exclude. When adding email addresses to exclude, it's important to consider all the implications of an exclusion. You can use upper or lower-case keywords. Matches exact string for subject keywords. Does not match partial words; you must list all partial words as separate terms. When you add subject-line terms to exclude from analysis, Workplace Analytics might not recognize uncommon compound words, especially those in languages such as Japanese or Chinese. For best results, use single words, separated by semicolons. Under Privacy settings, for Minimum group size to display in visual dashboards, type the minimum group size. You cannot use a value lower than 5. (Optional) Select Hide meeting subject lines from meeting query results to hide subject lines. This does not change the way a query functions; it changes only the display of the results. These changes take affect immediately in query results. (Optional) Exclude from analysis any domains, email addresses, or keywords in subject lines. Carefully verify that your privacy settings are correct and then select I confirm that all privacy settings are complete and that data will not be made available until user licenses have been applied. Settings can be finalized only if you've selected this check box. At the top right of the page, select Save. All subsequent changes to these privacy settings after the initial setup, take affect on the next data refresh of your organizational (HR) data or Office 365 collaboration data. Also, hide meeting subject line changes take affect immediately in meeting query results. Changes to the minimum group and hide meeting subject line privacy settings apply retroactively to all data, including historical data. Changes to the exclude from analysis settings apply only to new data collected during the next data refresh and do not affect historical data.